Many of us carry the scars of patients we have seen, victims of gun violence. The image forever etched in my mind is that of a 7-year-old. He had just gone to his room for bedtime. A drive-by shooter aimed at the house. He was hit in the head while he tried to duck. He was wearing pajamas. There was blood everywhere. The NRA stoked controversy last week with this tweet. The pent up response from physicians that erupted has been unified and forceful. I have decided to review the article from Annals of Internal Medicine that caused this storm. It’s a position statement from the American College of Physicians (ACP). Before I get into the Annals article, I’d like to comment on this statement by the NRA. I don’t write with a bias against guns or gun ownership. Guns were a big part of my childhood. I own guns. I favor legal gun ownership and recognize the need for regulation. In the U.S., the right to keep and bear arms as an individual is guaranteed by the Second Amendment. But this has always included reasonable restrictions. Even Scalia said, “Like most rights, the right secured by the Second Amendment is not unlimited (Section III).” The NRA is pressing to limit gun regulation, with the contention that this will allow legal defensive gun use and reduce or deter gun violence. Yet firearm mortality is increasing. Sadly, they posted this tweet just hours before yet another mass shooting in southern California. 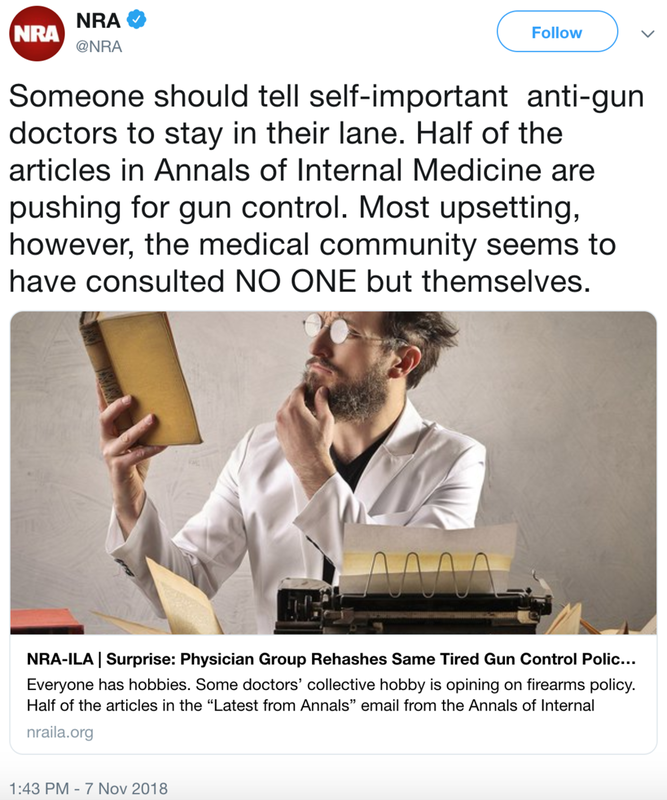 According to the NRA bylaws, one of its key objectives is, “To promote public safety.” So, why would they publish a tweet that undermines the physicians who are working toward one of their same stated goals? I don’t know, but I found the following information concerning. 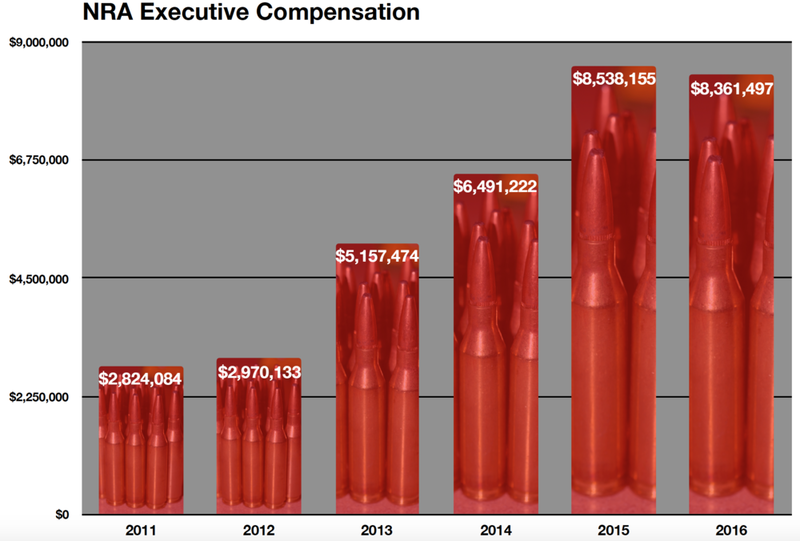 As the country is grieving and weary from ongoing gun-violence deaths, NRA executive compensation has steadily increased in parallel with the mass shooting victim count. I am not suggesting causation. I’m not even suggesting association. These two charts simply display two 6-year trends. The first chart shows that the NRA has been successful in increasing revenue from its membership. Use of social media to appeal to its members may explain last week’s tweet against doctors. The second chart shows that despite having increased resources to promote its agenda, which includes public safety, and to attract and retain top talent, the strategies of the NRA have not led to a reduction in casualties from mass shootings. Instead of using personnel and funds to attack physicians, why not rather join us to fulfill our common mission to promote public safety and sit at the table together to find ways to save lives? Of course, we won’t agree on every point, but there are solutions where we can form consensus. That’s what the ACP is doing by publishing these common sense solutions. Here are the main points of the Annals article. Take a public health approach to firearms related violence and prevention. This means forming a coalition of diverse people and interest groups to bring about social and legislative solutions. Physicians should speak out - This includes avoidance of state or federal requirements preventing a doctor from discussing gun safety with patients. It is the right thing to remind people that firearms are particularly dangerous in the home, “when children, adolescents, people with dementia, people with mental illnesses, people with substance use disorders, or others who are at increased risk of harming themselves or others are present.” Firearm owners should lock up guns and use best practices to eliminate accidental use, especially by children or by theft. We need to be informed on best practices to reduce risk with individual patients but also to advocate for the broader community. There is a correlation between prevalence of guns per capita and gun violence as well as tighter gun regulation with reduced firearm-related death rate. So, it makes sense to pursue well-crafted legislative solutions. Better reporting - “Federal law currently prohibits convicted felons; persons who use or are addicted to unlawful substances; those who have been involuntarily committed to inpatient mental health institutions; and those who have been deemed incompetent to stand trial, found not guilty on the grounds of serious mental illness, or otherwise deemed adjudicated mentally defective from receiving or possessing a firearm.” However, reporting to the national database, NICS, is voluntary, slow, and inconsistent. Does it not seem naive to think states will voluntarily report, which requires of them time, effort, and personnel - all of which costs money? It’s the old adage - people don’t do what’s expected; they do what’s inspected. The ACP also discussed several other potential measures to make our patients safer. Consider waiting periods - Evidence for waiting periods is not strong and is inconclusive. It may reduce suicide rate. Weigh the risk vs benefit of concealed-carry - Again, evidence is inconclusive on whether injuries occur less often or more often when concealed-carry of handguns is allowed. The College calls for a ban on firearms that can’t be detected with metal detectors; they also call for stronger penalties for illegal sales of any firearms. The ACP favors a ban on assault weapons and favors making existing firearms safer. But Dickey, author of the amendment - Republican and life member of the NRA, changed his mind before he died. He wrote an op-ed together with his former “mortal enemy”, Mark Rosenberg, director of the National Center for Injury Prevention at the CDC at the time of the amendment. If self-styled “mortal enemies” can come together and agree, there is hope. Just as research on car crashes prevented the death of 366,000 people from 1975-2009 without banning cars, so, research into firearms-related deaths can do the same - without banning guns. The NRA tried to put us in our place with this tweet. What they have done is to galvanize doctors of all political stripes and to unify us to act against gun violence. Physicians see and feel the human toll of gun violence on patients and families, and this transcends partisan differences. This is our lane. Who better than physicians to discuss the impact of firearms-related injuries on patients, the staggering mortality rate, or the terrible toll on family members when we tell them their loved one has died? We are the voice of our patients. We are the ones who touch the injured, maimed, and dying people affected by gun violence. We cry with their families. We cry as we silently drive home from work. We are the ones who peek in at night and hug our kids, glad it wasn’t one of them. We are the ones haunted by our patients’ faces and the blood and the destruction. We see their scars. We bear the emotional scars. We are sick and worn out with the violence. We care about our patients’ safety. In fact, I took an oath, “to consecrate my life to the service of humanity,” and that, “the health and life of my patients will be my first consideration.” I will keep my oath. We will not stop doing what is right for our patients. We invite the NRA to fulfill their stated mission to promote public safety and join us.